Vulture has foolishly neglected to keep you apprised of the ongoing feud between Led Zeppelin’s Jimmy Page and singer-songwriter Robbie Williams, but that all changes today, because there’s no other way to put this: This is the greatest thing imported from England since “Kashmir.” On background, the men have been feuding for years as neighbors in one of London’s toniest neighborhoods, as Williams has been trying to expand his home, underground, to build a swimming pool and gym for his family. Page, who lives next to him, argued to the city’s building council that the intended construction would damage the structure of his historic 1875 mansion, and after five years of trying to stop the expansion, the committee ultimately sided with Williams. Sure, rich people fighting about rich people stuff isn’t exactly unorthodox, but documents obtained by both the BBC and The Telegraph point to something truly bonkers about how Williams is handling this victory lap, and it is a gift. That’s because an anonymous neighbor of the duo has submitted a formal comment to the building council, citing annoyance that Williams is hell-bent on pranking his neighbor through various sonic means. 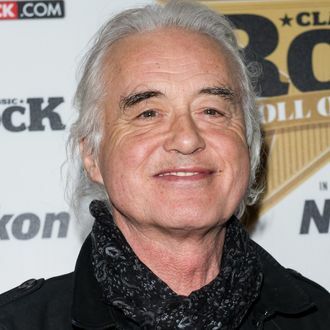 “The committee may not have been aware that Robbie Williams has been playing loud 70’s rock music on outside speakers when he views Jimmy Page outside his home,” the neighbor wrote, citing rival bands Black Sabbath, Pink Floyd, and Deep Purple as being on constant rotation. The neighbor also said Williams has dressed up on numerous occasions as Zepp co-founder Robert Plant, choosing to imitate him by wearing a “long hair wig and stuffing a pillow under his shirt.” We guess you can say there isn’t exactly a … whole lotta love between these two, hey, oh, hey, oh.